The fishing is a little tough right now. Make sure you check your lures often right now as there is green vegetation in the water right now and it is accumulating on the lures right now. This will send the fish the other way from your lures so try to keep this clear of them. Try for Lake Trout straight out and North of the harbor in 100 to 180 foot of water. Dodgers with spin and glows and clean spoons off the downriggers close to the bottom are working. A few Steelhead and Salmon are being taken in the same areas using bright colored spoons off the Offshore boards, using some 2,3,5,7,and 10 colored lead lines. A few Walleye are being taken North of the harbor trolling the shallow water with small spoons, hot and tots, and crawler harnesses. Bass continue to be taken casting small spoons and body baits in close to shore. Sounds like the wind on Friday will be making the lake a little rough so remember to use caution, the fish will still be there the next day. Lake Trout have been taken straight out and North of the harbor in 80-120 foot of water fishing close to the bottom using dodgers with spin and glows close to the bottom. Spoons have been working as well fishing 50 to 10 foot off the bottom. A few Salmon and Steelhead continue to be taken in 100 foot of water fishing the top 60 foot of water using spoons off the downriggers or 3,5,7, and 10 colors of lead off the boards. Bright colors are working best. A few Walleye have been taken North of the harbor in close to shore using small spoons, hot and tots, or crawlers. Bass are in close to shore, try casting small body baits and spoons for best results. 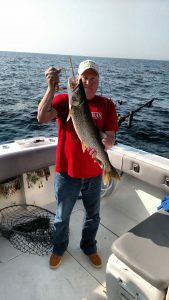 Lake Trout have been taken straight out and North of the harbor in 50 to 80 foot of water. Try Dodgers with spin and glows close to the bottom and spoons at various depths off the downriggers. 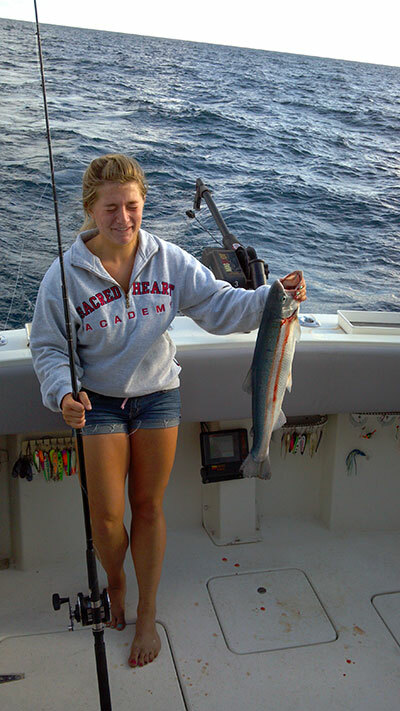 Some Steelhead have been taken in the same areas using bright colored spoons off the Offshore boards. Try 2 and 5 color lead lines for best results. A few Salmon have been taken in the 30 to 60 foot of water areas off the boards with lead lines and spoons. A few Walleye were taken in close to shore on small spoons and small body baits. A few Steelhead are being taken North and Straight out of the harbor in 105 to 160 foot of water working the top 60 foot of water. Try some bright colored spoons off the boards using 7,and 10 colored lead lines. Lake Trout are being taken in 90 to 130 foot of water straight out and North of the harbor. Try dodgers with spin and glows and clean spoons off the downriggers working close to the bottom. Best colors have been blacks with glow, purple, and green with yellow and red. Some Walleye continue to be taken in the 70 to 130 foot of water areas straight out and North of the harbor. Try some 5, 7, and 10 colored lead lines with crawler harnesses, thunder sticks, spoons, and Hot and Tots. Work from top to bottom with the downriggers with some spoons and thunder sticks. Best colors have been purple, black, green, and blue.